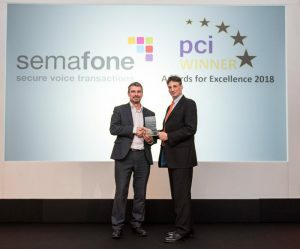 Guildford, Surrey, 25 January 2018 – Semafone’s patented Cardprotect solution has been recognised once again as the industry-leading solution for compliance and data protection at the PCI Awards for Excellence, run by AKJ Associates. 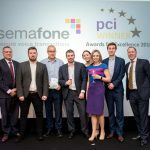 The award was given to Semafone for its “outstanding PCI DSS project”, delivered alongside 360 Solutions to online electrical retailer, AO.com. The implementation of Cardprotect has not only meant full PCI DSS compliance for AO.com, but also significant financial savings for the retailer; using 360 Solutions’ Gamma-hosted platform to migrate all phone lines onto SIP trunks, AO.com now has complete scalability for peak times and seasonal demands. The project also saw a rise in both customer and agent satisfaction, with customers expressing appreciation for the extra security the household appliance retailer had put in place. 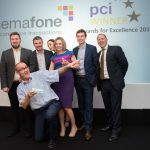 This is the second year running in which Semafone has achieved success at the PCI Awards for Excellence. 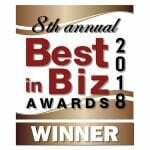 Last year the company won an award for projects with broadcast giant Sky and insurance company AXA. 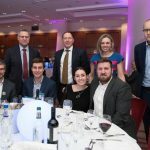 Adam Warne, group IT director at AO.com commented “Securing customer data is a top priority for us, and PCI compliance is an essential part of this. Semafone’s approach, of taking data out of the contact centre entirely, achieves both objectives at once. It also allows us to go a long way in preparing for the incoming EU GDPR. It’s great to see the team receive recognition for their hard work”. Thrilled to have won an award!